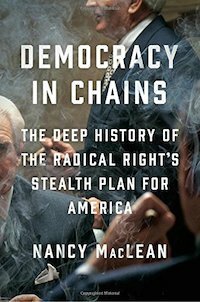 Democracy in Chains: The Deep History of the Radical Right's Stealth Plan for America by Duke University history scholar Nancy MacLean (Viking 2017) has won the 2017 Lannan Foundation Cultural Freedom Award for an Especially Notable Book. Established in 2014, the Lannan Cultural Freedom Award for An Especially Notable Book honors nonfiction works of particular relevance to the current historical moment. The award recognizes writers whose work is of particular scholarly or journalistic quality, and also has purpose in providing ideological tools to inform and support struggles for cultural freedom and social, economic, and racial justice. "How did we get to where we are today? How did corporations come to possess 'rights'? How did democracy come to be defined as individualism? Or money as free speech?" asks historian Greg Grandin, author of The Empire of Necessity. "Nancy MacLean's Democracy in Chains provides the answers. It is essential reading in order to understand the ideas that billionaires use to justify their control of our political institutions. I can't imagine a more urgent book." View Nancy MacLean's extended biography here.